Embers Maple Single Trunk This tree is ‘Mountain Grown’ at Alpha Nursery and is an ‘Idaho Preferred’ Plant. 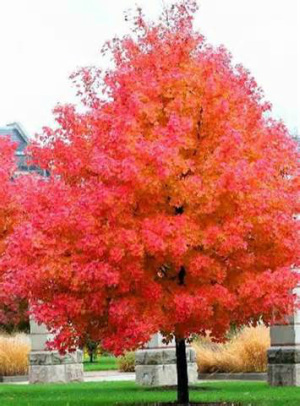 Embers Maple is a small single or multi-stem tree. Leaves are pale green in spring that turn dark green in the summer. The leaves turn a bright red in the fall. It has tiny white blossoms in early spring that turn into bright red, winged samaras (helicopters) in midsummer. Use as screen, hedge, as a specimen or an accent. Embers Maple attracts bees, is deer resistant, and is a firewise plant. It is also drought tolerant once it is established. Embers Maple likes to be planted in full sun.